A Springfield dispatch to the St. Louis Globe-Democrat states that a most wonderful freak of nature has been discovered in Xenia in the person of little Allie Simms, the 3-year old daughter of Charles Simms, Jr. It is doubtful if her like can be found anywhere upon the face of the earth and her condition is one that perhaps will never be satisfactorily explained by science, and it shows to what extent nature will sometimes go out of the ordinary way to mystify mankind. This little living wonder, who will no doubt go down in history as one of the strangest subjects of the twentieth century, was born in Kentucky and was brought to this city a short time ago. The child is rather small for one of her age, but is considerably above the average 3-year-old child in intelligence. She has a somewhat queer-looking face, with sharp, snappy eyes, and an uncontrollable temper. On her tongue are to be seen the figures “76” plain enough for anybody to read. Besides these, when she was born, the word “Allie” was also visible on her tongue, and for that reason she was given the name Allie. At the time of her birth the word was so plain that it created a great deal of interest among the doctors. Usually the figures on her tongue are white, but sometimes they turn red. But this is not the strangest part of the story. According to the statement of her father, the child is a sort of periodical chameleon letter press. Once in every 28 days, or about the 29th of each month, regularly, her body becomes entirely covered from head to foot with letters of the English alphabet and Bible verses that can be seen and read by anyone. The letters are about the size of the ordinary newspaper letters, and her father says her whole body presents the appearance of a newspaper, as far as printing is concerned. The only plausible story advanced for this strange phenomenon is that the impression must have been made in some way through the nervous system by the mother during gestation. The letters and verses are only visible about the 29th of each month, but the figures on her tongue can be seen at all times. The child was three years old last May. Her mother is dead, and just before coming to Xenia she was put into the children’s home at Cincinnati, but as she has such a high temper her father thought the managers would not understand her and would punish her too severely, so he brought her here and she is staying with Mrs. Emily Lawrence, in Lawrence Alley. NOTE: There is no mention of exhibiting the child, so apparently financial gain was not the point if this was a hoax. If this was a real story (and it does appear in the St. Louis Globe-Democrat after all…) it is possible that the child had the condition known as dermographia or “skin-writing,” where the skin is so sensitive that touching it produces welts and inflammation, which can look like writing. 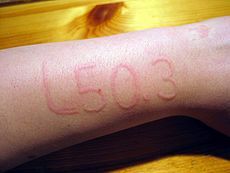 Some skin diseases, like scabies, can also produce linear markings on the skin. The periodicity of the writing is an interesting touch. Obviously the child was too young for menstruation, but perhaps hormonal fluctuations, which can affect the immune system and allergic reactions, were responsible. You will note the reference to maternal influence. Given her “high temper,” (which also suggests allergies and hormonal problems) young Allie was fortunate that the number “666” didn’t appear; she might have been labeled a spawn of Satan. This story and other Forteana may be found in The Headless Horror.